I finished the first of my current mittens-in-progress. It wasn’t until I downloaded the photos to my computer that I spotted the error in the pattern on the back of the hand. Can you see it? Anyone want to offer a name for this pattern? Leave all suggestions in the comments, please! 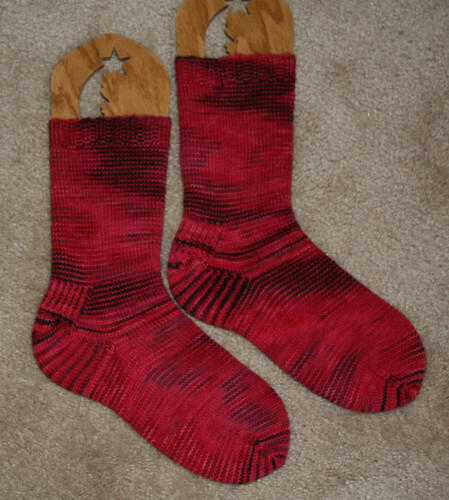 To recap, these are knit from Tempted sock yarn in the “Roxanne” colorway, on 2mm needles. Top down. The free pattern is available in pdf format here. Lucy seems underwhelmed, doesn’t she? I like the name “Dotty” for the these mittens. Very cute, as are all of your knitted items. Thanks for the great blog site. 5th repeat down on the first mitten photo. If you did not call it out, I might not have noticed it. I did the same thing with a bobble stitch scarf. I decided that if it took a lot of effort to find this kind of “design element” it was not worth loosing sleep over it. Don’t tell anyone and most people will never notice it. The mitten is beautiful. Well, I personally think you should call it a design element, not an error 🙂 And they look perfect to me!! The mitten is beautiful even with the error. They look like little bubbles so I say call it: “Tiny Bubbles” or “Ye Olde Fair Isle of Bubbles”. Lucy is waiting with “baited” breath for the name. I do really like the pattern, but when I try to come up with a name, the first thing that pops into my head is “fish eyes”. However, that doesn’t make for a very complementary name for a mitten. Unless you call them “Fisken øye” mittens! “Bullet glass” os my suggestion — reminds me of those Victorian bullet glass windows. Yes, call the two bullets saddled together a design element and make #2 just like this one! Lucy must be thinking that it’s just about peep time! If you duplicate the “error” on the other mitten it’s a design element because it’s swallowed into the crease of the palm. Ask any palm reader! I did notice the error, but meh. I’m a big proponent of handknit things actually, occasionally, looking hand knit. Anyone who notices without prompting deserves a firm-but-gentle mitten thwap. As for a name, I’d call them “Labyrinth,” because they make me think of the little clusters of moving eyes that grow on the walls of the labyrinth in the movie of the same name. Which I hadn’t seen in ages and ages (David Bowie, Jennifer Connolly… please tell me I’m not the only one who’s seen it! ), and recently introduced my daughter to, so it’s toward the front of my mind. I love your FOs. I would name these mitts “Many Eyes are Watching”. The circles remind me of eyes. I think you should call the pattern “Kitties and Arrows” because the little circles on the outside of the mittens look like cats and on the palm there’s little arrows. I don’t know. It’s a little dorky. Oh well. I think its still kind of cute. Octopus, they look like the suction cups on an octopus’ arm. 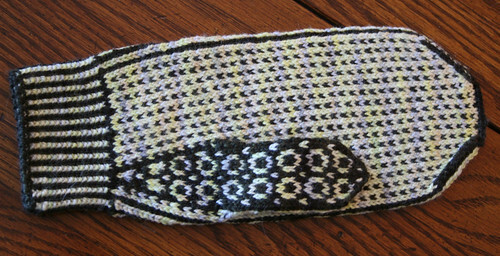 Very nice mitten – I love all the dots! The error looks like the gloves are kind of folded at that point, like there is a crease in the fabric that flaws the pattern. Question is: Will you fix it or knit the second one just like it? Tiny Bubbles in the Pool. Are you a machine?! I can’t believe how fast you turn out FO. They’re lovely, and I never would have spotted the error if you hadn’t told us to go look for it. Hindsight is 20-20 – they are beautiful nonetheless!! I’m thinking Tortoise Soup. The boo-boo fits right in with an irregular shell pattern. They’re lovely! I love them — maybe they need a name like Bird’s-eye Maple? Or just bird’s-eye? They remind me of the knots in a bird’s-eye maple bowl I have. I’m another who’s first thought was “fish eyes” when I look at the pattern. It makes me think of the fish they took out of the polluted lake on The Simpsons! Eeeexcellent. Here’s a few name suggestions — I love Dotty but also Dot, Spot, 101, Binary, and Squeek. That was the first thing I thought of when I saw the finished mittens. They’re lovely! How about Honeycomb Mittens? I really like the subtle color changes in the yarns and how they play togther so nicely. I did notice, but I was a proofreader and now a taxonomist (aka professional nitpicker…) Nice mitts though! What are you going to do – leave it there or rip back? I think “Frog Eggs Mittens”… I know it’s a bit weird, but all those circles with little dark spots remind me of frog’s eggs. I thought fish eggs, first, so . . . Caviar! that is a creative pattern!!! If you called it Mitosis, or Meiosis, it would be a design element. Yes, Nonpareils! Both front & back remind me of those. that suits the, er, slight irregularity of the pattern, too – like a random scattering of brown & white sweets. That is so a design element. Kind of reminds me of Escher. As for a name, I’m liking Bullseye glass. The color variation reminds me of stained glass. Aren’t errors just design elements? I think the pattern looks like some of the Polish stoneware patterns I’ve seen. There is a plethora of web sites selling them. Very nice mitten, I think! They remind me of blackwork embroidery so I think you should name them “Holbein” after the stitch method used. how about “seeing spots mittens”?? Never would have noticed unless you pointed it out! It’s a creative outlet!! How’s about “Stars ‘n’ Snowflakes” ?? Reminds me of a winter night snowy sky! i dunno if anyone said it yet, but how about black-eyed peas? The error looks cute! Will you make the other to match? I agree with Deb…I was going to say Caviar, too. Love ’em. Hey, a tiny flaw makes them all the more special, right? And I think it just looks like a tiny crease in the fabric. Super fly – because they are super, and remind me of a thousand little eyes, perhaps looking like what a fly might see. They look like daisies to me, so “Daisy Chain”. Also, didn’t the error occur right after taking the photo for Thursday’s blog entry? So it’s our fault. How about Fish Eyes??? I love the pattern. I’ll have to second Natalie’s (#56) suggestion of Argus. I was going to say Peacock initially but the colours don’t work as well. I see it! 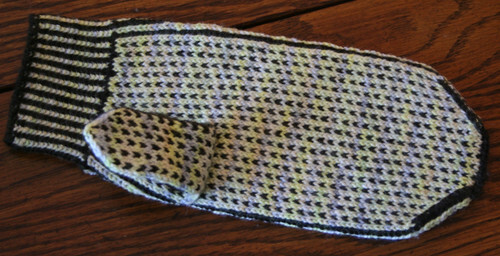 And you know, if the whole glove was patterned like the mistake section, it would look kind of like scales! The pattern reminds me of a mosaic, so that’s what I’m throwing my vote in for. Mosaic Mittens. The first thing that popped into my head was “Spaghetti Uh-ohs”. 😀 You make beautiful mittens, even when you have unintended pattern features! I think they look like small flowers. So I would say either Flower Patch mittens or Peerie Patch mittens. They look nice and warm. Fish Eyes and Caviar. Which other people have already suggested. I like Cheerios too, but that’s my favorite cereal. And to Kate–I love Laybrith! It’s a fun movie. It’s all but invinsible. If I’m right, I’m not sure there is an error. “Winter Garden” A very tempting pair of socks indeed! 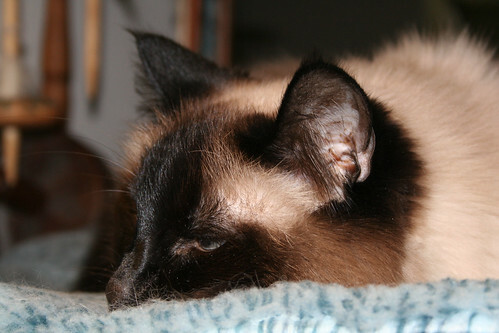 I’m with Lucy, it would be so nice to nap when I please. “Spots and Dots?” I had to look a while to see two rows of 4 circles in a row, without the intervening spaces usually separating these rows. But seriously, no one will notice! I like the name RoseHip because thats what the small circles remind me of hidden amongst the leaves of a rose briar. Dangit! Danielle beat me to it! I *immediately* thought, “googly eyes” – even before I saw that you had a name-the-pattern contest. The mistake rows look especially googly eyed. It’s a great pattern – lovely work. Is the mistake towards the end (knit from the cuff?) or at the beginning (knit from the fingertips?) I really like how you handled the thumb patterning. Wonderful! Thanks. How about Code Monkey? The design reminds me of HTML code and poor Casey from Ravelry is such a diligent coder, he deserves the name sake. So, yes, you MEANT to skip ahead a few rows in the stitch pattern, didn’t you? How about Bees (palm) and the Honeycomb (back)? I cannot see any error. All I see is perfection. I’m speaking of Lucy, of course. Darn, sometimes I get so excited that I forget to type in my email; and then my inspired essay is gone! And no amount of back-arrowing will bring it back. Ah well, here are my usual silly ideas. I haven’t read all the comments (it’s bedtime), so I apologize if I’m redundant. PS: Do I perceive a poll in our future? Or will this one be an executive decision? By Lucy the disinterested, perhaps? I see the two rows of larger circles, almost overlapping, without the smaller circles between! Oh well, such is life! They still look great! I think you should call them “Caviar”. Bubblewrap. (I see you already popped a few). I’d never have spotted it if you hadn’t mentioned it, and that does appear to be just about where you stopped to take the photo of the unfnished mitten on your hand. Another day, another design element. The pattern reminds me of tapioca, but I’m not suggesting that as a name! Here’s Lookin’ Atcha (they look like frog’s eyes; a couple of rows got jammed up there, didn’t they? Are you going to, er, frog? For the name… something like “All eyes are on me”. They remind me a little of Venetian “millefiore” (million flowers?) glass. My mom had a small black and white paperweight she got in Italy that looked a little like your mittens with larger circles in the middle surrounded by a sea of tiny dots. Very cool no matter what you call them (and the palm was strobing on my computer so I didn’t look at it long enough to spot any errors!). They are still lovely mitts – despite the lack of a certain little circlette. in fact, I’d call them Circlette. I think that’s one of my fav Lucy pics of all time. Cheryl got there before me. Immediately I saw them I thought “Frog Spawn Mittens”. Whatever you call them, they’re very nice and no-one is ever going to notice the mistake. They are lovely. How about Hot Cocoa and Snowballs? Better make it Mint Hot Cocoa and Snowballs, I think that colorway is a green, isn’t it? It reads pretty light on my monitor. How about “Baby’s Breath” like the tiny flowers in bouquets? Also I think the “knuckle design” is very clever!! Enlarged it looks like a field of flowers, or in French, Champ du Fleurs. Romantic, don’t cha think? Odo! The shape shifter from Star Treck…it explains the “shift” in the design and all those lovely O’s. I like Deb’s Caviar too. Nice and classy. Those gloves really add Umph to my Fair Isle desires. Gorgeous! I think fish eggs would be fun…although Caviar (above) sounds nicer I guess. The first thing I thought when I saw them was “fish eggs” though. You could also call them bubble mittens. How about cheery-oohs. Love all the mittens and Lucy shots. The socks are such a vibrant color too. I did see the error, but I have a horrible gift that enables me to spot things like that with just a glance. Friends have been known to hide their work from me but when the counts are wrong and they can’t figure out why, I am the one they come to. I like the name Subduction, also Hands Up and Dotty. I have no talent for figuring out names. Maybe I’m just hungry but I was thinking oreo cookies. I actually prefer my cats to be underwhelmed by my knitting, since the alternative seems to be waaayyy too interested in the moving yarn. Lucy does do underwhelmed beautifully! 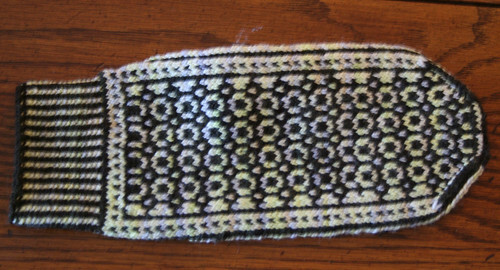 The mitten is lovely and the error doesn’t look so bad. I thought of hobnail glass when I saw them. I also agree with the person who suggested rosehip. They are lovely. Oh how you get us to be tempted to try fun knitting. My first thought for the mittens was Special Roe, because they look kind of like eggs and they have that special row…corny, I know.